Join Lancashire Wildlife Trust's Outdoor Adventure Club this summer! For children aged 8-14. 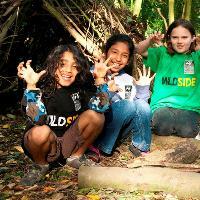 Wildside is Lancashire Wildlife Trust's Outdoor Adventure Club for children aged 8 - 14* years. Wildside activities vary each day, but may include activities such as shelter building, fire lighting, woodland games, minibeast hunting etc. It's a chance to get outside, go wild and have an adventure this school holiday! Children should come dressed for the weather conditions wearing sturdy footwear. All weather clothing is required and they should bring a packed lunch, snacks and drinks. You can also extend the day from 4.00pm - 5.30pm with Badger Sett. 20 minutes free parking is available to drop off and pick up children. We will ask you for your car registration number when you sign children in and out. If you wish to stay at Brockholes after dropping off or collecting children, then normal charges apply. * Your child must be 8 years old. Please do not be tempted to book unless your child will be aged 8 to 14 years on the date of the session. If your child is not 8 years old, they will not be accepted to the holiday club and turned away on the door without refund.